A retrospective of music by Hawaiian New Age music composer Robert Æolus Myers, called “Talisman”, is being released on 2xLP 26 April 2019 by Origin Peoples. Over two years in the making, ’Talisman’ is a re-interpretative celebration of the work of American musician Robert Æolus Myers. Touched first by the emotional depth of the music, and subsequently by the warmth and wisdom of the man, Origin Peoples sought to capture a snapshot on this special vinyl release. This newest chapter of the Æolus myth seen for the first time on vinyl are five of his most expressive pieces, alongside a quartet of remixes by kindred spirits from all corners of the globe. 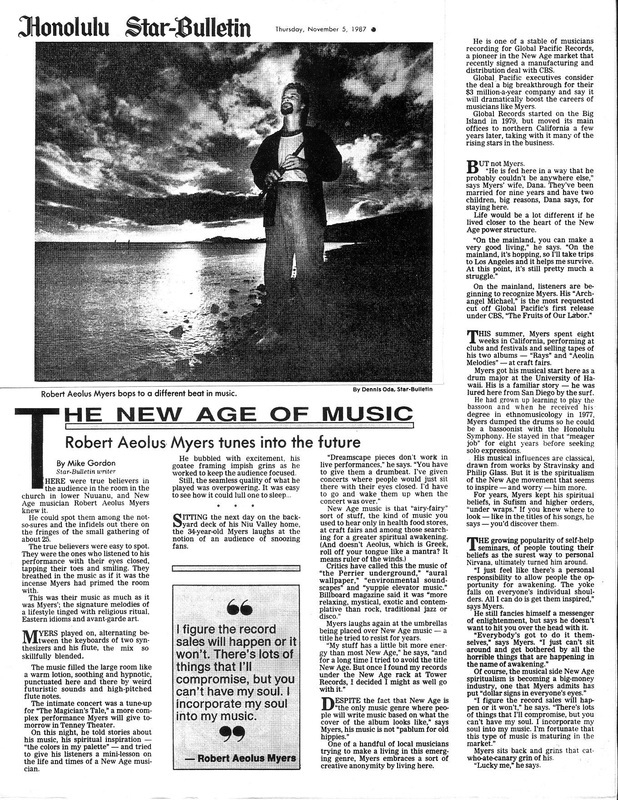 This is the first time his music has been interpreted by others, and Robert’s delight at the result speaks volumes of his adventurous and open-minded attitude. Approaching the often intangible new age genre with a humanist approach, Robert creates immersive and expansive pieces which connect with the listener on a spiritual and emotional level. Archetypal narratives are retold through nuanced electronics, evocative motifs, and empathetic flute, the varied compositions informed by Myers’ classical training, spiritual pursuits, and study of ethnomusicology. Part retrospective, part remix project, ‘Talisman’ is the perfect reflection of Robert ÆOLUS Myers, a musician whose timeless expression of theme and emotion has enriched minds, bodies and souls for almost 40 years.